Mobile Bariatric Weighing Scale, Portable Bariatric Scale, Mobile Scale, Detecto, DR660. The Mobile Bariatric Weighing Scale, manufactured by Detecto, is a lightweight, yet spacious portable weighing platform for bariatric patients. This scale's exceptional design produces high-efficiency. 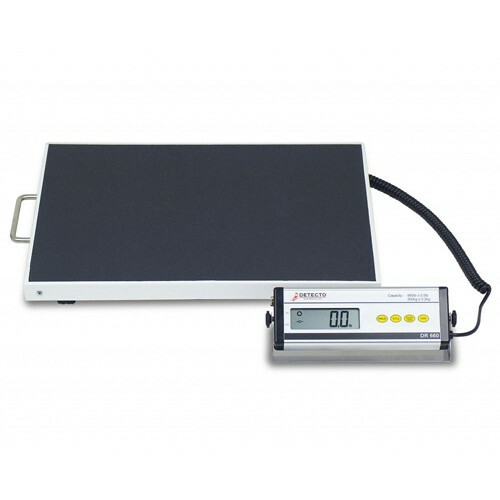 The weighing platform has an integral rechargeable battery, which provides 8 hours of continual usage. In addition, the scale indicator is easily readable, as it generates readings on an LCD screen. 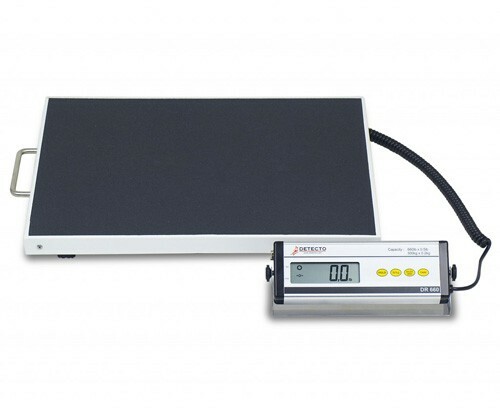 The scale indicator also features an adjustable tilt screen for the best possible viewing angle. To increase the scale's accuracy, the indicator has a tare key, which is essential to remove weight when a patient is carrying items. Another great attribute is the indicator's hold button, which allows the medical professional to give a patient his or her full attention before recording measurements. The Mobile Bariatric Weighing Scale features a handle that supports the ease of mobility around the clinic. Power-saving selectable timing auto shut-off feature. Application: Measures weight for bariatric patients.